Thousands of people poured back into the centre of Christchurch on Saturday 20 October and filled the new public spaces around Mollett Street for FESTA 2018’s headline event FEASTA! in a vibrant celebration of architecture, community and food. From big band music, family activities, belly dancing, weaving and the smell of cooking to Chinese cultural performances, quick-fire talks, food demonstrations, artistic projects and colourful architectural installations, this night out for all ages was a veritable feast for the senses. 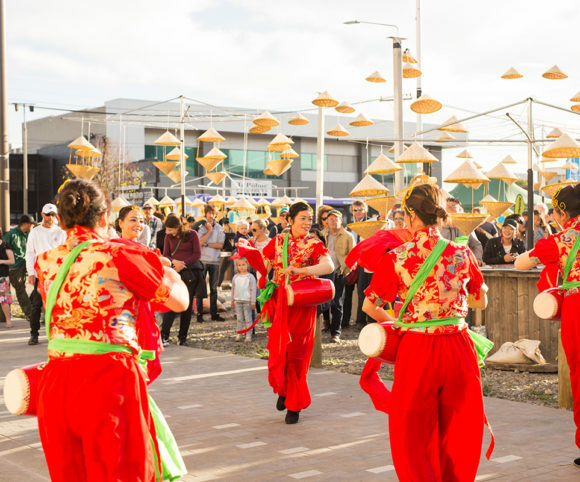 Christchurch’s brightest street party opened at 5pm with a children’s parade, lion dancing and samba band, before performance areas in the Little Asia food market and community picnicking space got underway. 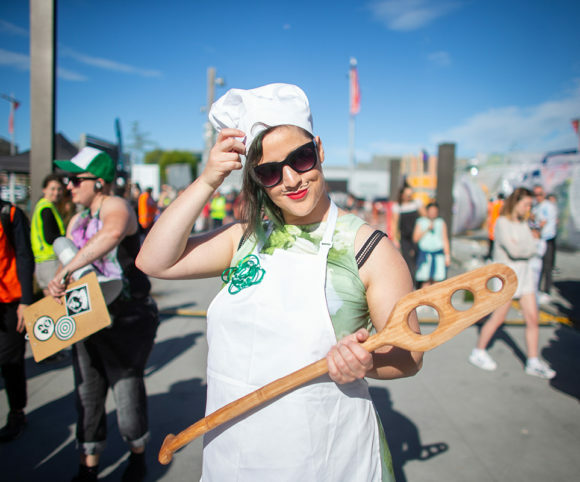 For this celebration of collaboration, city-making and food, local businesses, performers, artists and musicians activated the spaces created by 17 imaginative artistic and architectural installations, which all explored the theme of food and Christchurch’s ongoing relationship with it. People gathered in a unique bamboo structure to eat food from across the globe together; food memories were exchanged for edible products made by small-scale producers at Cottage Connection. 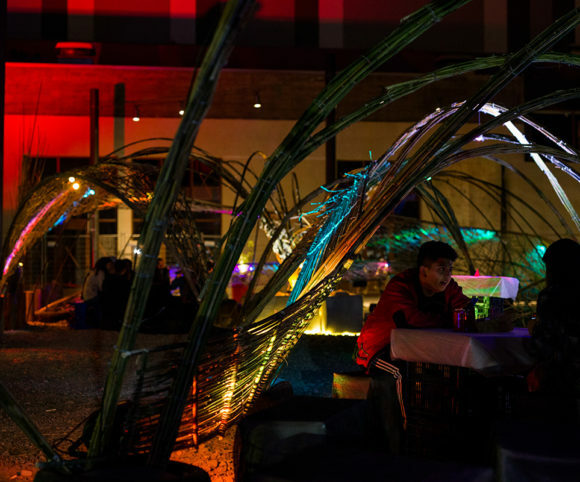 People also exchanged koha for kono (hand-woven food baskets with native seedlings) at multi-artist collaboration Kono for Kai, while others enjoyed unusual brews at the bar of the future – a Massey University and Punky Brewster collaboration. 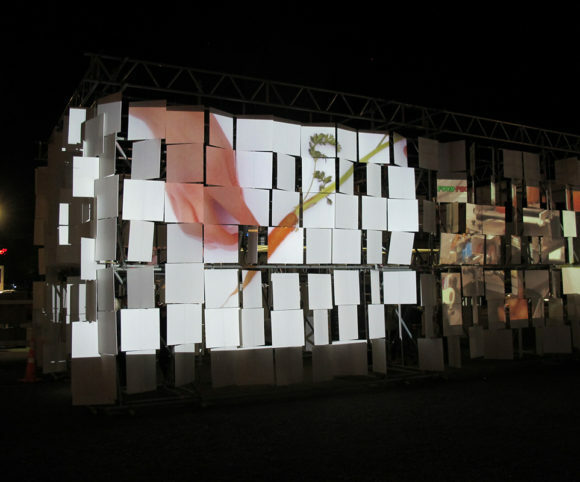 The interactive and large-scale Sounds Like Dinner installation, presented by members of the Canterbury branch of the NZIA, offered a future food ‘nostalgia’ experience via recordings of cooking food that people could listen to and projections of food preparation video clips. 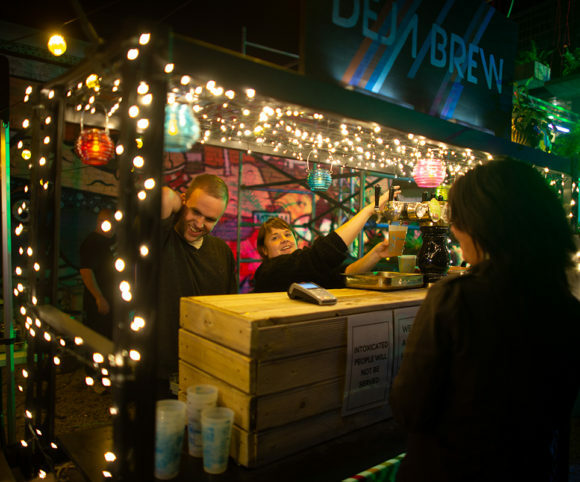 It was a night of warmth and of people gathering in their city centre to enjoy a showcase of urban creativity. From food vendors and the construction industry to design and architecture students, as well as professionals and the public, people from all walks of life came together to experience a reimagined Christchurch and they collectively transformed a city block. An estimated 12,000-14,000 people attended, though as many stayed for hours to enjoy the range of installations, activities, food and performances on offer, it was difficult for organisers to determine an exact figure. The FESTA team wish to thank all of those involved in creating a special night and the public for turning out in such numbers.